You look out into the distance and see puffy white clouds against the crisp blue sky. The warmth of the summer's sun embraces you, while a cooler breeze soothes your skin while carrying the smells of nearby blossoms. You pause to take it all in and you feel completely relaxed and at peace. After a few minutes of bliss your mind begins to wonder, "Can I take this feeling home with me?" You can! This is exactly how it feels to eat panna cotta. It is so much more than an ordinary dessert as it is smooth, silky, warm, cooling, fragrant and comforting all in one small serving that is no more than a tasting. Panna cotta is an Italian custard dessert which translates as "cooked cream." Unlike other custards, it does not include eggs and is usually made with a cream and gelatin base. Before I became vegan this was one of my favourite desserts and it was only recently when I discovered how to whip up a vegan version which is just as amazing - if not better! As for flavourings, it is up to you and feel free to experiment. 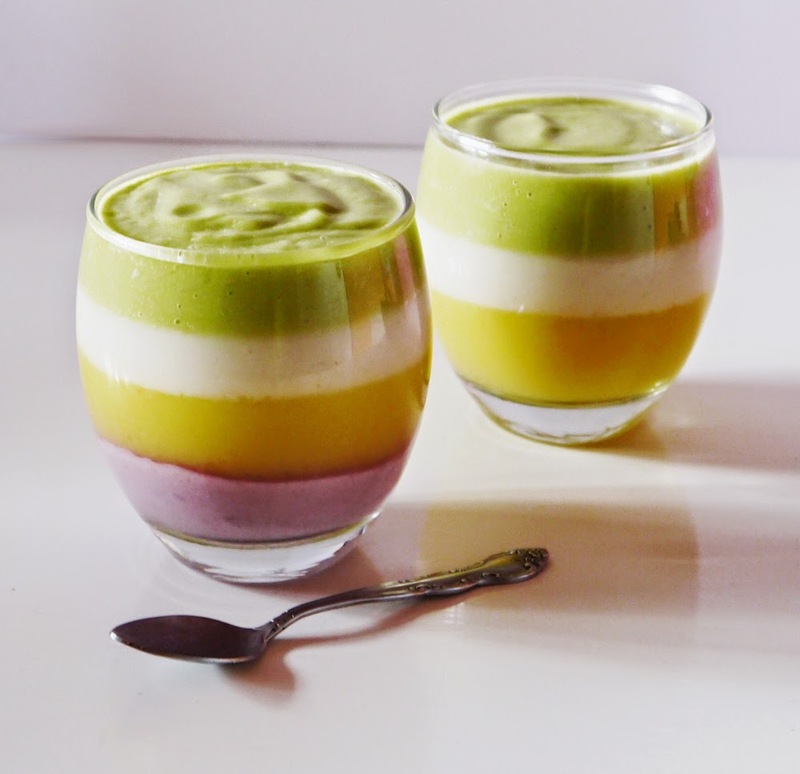 There are many kinds of panna cotta such as berry, herb, citrus, spiced, and floral. This is a recipe for a lemon infused version which is actually very simple to make. Instead of cream, we will be using coconut cream, and instead of gelatin, we will use agar agar and tapioca, which has a very similar effect. In this photo the lemon-coconut appears in the white layer. The other's are jackfruit, taro and avocado. For 6 x 4oz servings. In a blender, blend the agar agar powder and water for at least 3 minutes. You want to make sure that the agar agar is dissolved as much as possible or else it will be a strange texture. Add the tapioca flour and blend for a few seconds until well mixed. In a medium sized sauce pan, combine coconut milk, sugar, lemon zest and vanilla and whisk so that the sugar is dissolved. Add the agar agar and tapioca mixture and bring to a gentle simmer for one minute. As soon as the panna cotta is lightly thickened (approximately 5 minutes) transfer into serving containers. Chill for at least 4 hours (if not longer). Top with your favourite couils or fresh fruits.